My accommodation at this hotel was something really beautiful! A unique perfect 360° view & friendly and helpful staff to help me whatever I asked and whenever I wanted. About my room? Large + cozy + with fantastic view!! What more can someone ask for? All the above and my need for relaxing found the perfect match..
We were warmly welcomed to kalestesis suites. Thanos was very nice and helpful with recommendations where to go visit and eat. The hotel is a bit remote but we rented a car which saved us. The rooms are clean and spacious. Breakfast was excellent! Gigantic omelette ! Very pleased with our stay. Kalestesia Suites is a gem of a place tucked away from the main parts of the island. It is on top of a hill and offers fabulous views of the whole island. You could hire a car if you will be exploring the island i.e. Oia and Thira otherwise there are local buses that are meant to run every half hour to Fira. The food is absolutely delicious. The pasta with prawns was amazing and breakfast was really good and generous. The room was really nice and clean and had fabulous views of the Caldera. Best of all though was the hospitality. Meni and Thanos were just amazing. Meni called just as we landed and gave us great tips on where to go and how to navigate the island. Thanos was on hand to help us with everything we needed including our laundry after a heavy downpour. He also served in the restaurant and was just generally a delight to be around. I loved staying here although it was a short visit and we will definitely be back. Thank you so much for your lovely comments and excellent review. We are so happy to read that you've enjoyed your stay with us. It was really a pleasure meeting you both and we'll be even happier to welcome you again in Santorini and Kalestesia Suites! Take care! Greetings from all of us here. This place is truly a hidden gem and is even better in real life than anything you’ll ever see or read about online. You won’t want to stay in Oia or Fira or anywhere else on the island if you come here. It’s off the beaten track, literally, at the the top of a hill giving 360 degree views of Santorini away from the maddening crowds. We stayed for 10 days B&B in a ground floor superior double room overlooking the pool with a sea view (all rooms have a sea view). The accommodation was delightful, decorated beautifully, contemporary yet in keeping with traditional design with all mod cons you’d expect from a 5* hotel. The service was absolutely first class, Thanos and Meni on reception couldn’t do enough for us. They booked trips, restaurants, taxis and provided us with all the information we needed along with a smile and great sense of humour. Jasper, our wonderful bar man and waiter, was the icing on the cake! What a character! We will miss his wonderful, funny stories from afar whilst enjoying his unique cocktails at the pool bar as the sun went down. All that and then there’s the sunset...oh my, there are no words to describe it! Just sit on the rock overlooking the caldera with a glass of wine and watch the sun dissolve into the sea! The sunset here was even better than on our boat trip and you don’t have the many tourists who gather for it in Oia! You’ll need a good pair of sandals and be prepared to do some walking if you don’t hire a car as this place is on the top of a hill with a 15 minute downhill walk into Akrotiri where there are some lovely tavernas and local buses to get you to all other parts of the island. We hired a car for 4 days which was enough for us to explore the island. However, the hotel can arrange transportation so a car is not essential. Finally, the hotel s restaurant was very good, breakfast served on the terrace was superb and there’s room service too. 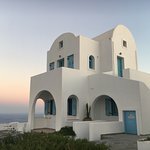 This was our first time to Santorini and it far exceeded our expectations as did Kalestesia Suites. We didn’t want to leave and we will be back! So happy to see and read your excellent review! Thank you so much for your amazing comments. It was really a pleasure meeting you both and we'll be even happier to welcome you again in Santorini and Kalestesia Suites!